After record-breaking funding and deals involving artificial intelligence startups in 2017, it may be tempting to invest in the next AI business or business idea without a close look beyond a company’s data, products, user-base, and talent. Indeed, big tech companies seem willing to acquire, and investors seem happy to invest in, AI startups even before the founders have built anything. Defensible business valuations, however, involve many more factors, all of which need careful consideration during early planning of a new AI business or investing in one. One factor that should never be overlooked is a company’s actual or potential intellectual property rights underpinning its products. Last year, Andrew Ng (of Coursera and Stanford; formerly Baidu and Google Brain) spoke about a Data-Product-Users model for evaluating whether an AI business is “defensible.” In this model, data holds a prominent position because information extracted from data drives development of products, which involve algorithms and networks trained using the data. Products in turn attract users who engage with the products and generate even more data. While an AI startup’s data, and its ability to accumulate data, will remain a key valuation factor for investors, excellent products and product ideas are crucial for long-term data generation and growth. Thus, for an AI business to be defensible in today’s hot AI market, its products, more than its data, need to be defensible. One way to accomplish that is through patents. It can be a challenge, though, to obtain patents for certain AI technologies. That’s partly due to application stack developers and network architects relying on open source software and in-licensed third-party hardware tools with known utilities. 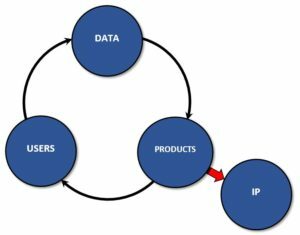 Publicly-disclosing information about products too early, and publishing novel problem-solutions related to their development, including describing algorithms and networks and their performance and accuracy, also can hinder a company’s ability to protect product-specific IP rights around the world. US federal court decisions and US Patent and Trademark Office proceedings can also be obstacles to obtaining and defending software-related patents (as discussed here). Even so, seeking patents (as well as carefully conceived brands and associated trademarks for products) is one of the best options for demonstrating to potential investors that a company’s products or product ideas are defensible and can survive in a competitive market. Patents of course are not just important for AI startups, but also for established tech companies that acquire startups. IBM, for example, reportedly obtained or acquired about 1,400 patents in artificial intelligence in 2017. Amazon, Cisco, Google, and Microsoft were also among the top companies receiving machine learning patents in 2017 (as discussed here). Patents may never generate direct revenues for an AI business like a company’s products can (unless a company can find willing licensees for its patents). But protecting the IP aspects of a product’s core technology can pay dividends in other ways, and thus adds value. So when brainstorming ideas for your company’s next AI product or considering possible investment targets involving AI technologies, don’t forget to consider whether the idea or investment opportunity has any IP associated with the AI. Next post: Not Could, But Should Intelligent Machines Have Rights?